One of the key cards in 2012 Topps Finest Baseball is free from its packaged tomb. The 2012 Topps Finest Autographed Jumbo Patch Superfractor Yu Darvish was pulled last night during a live case break in Florida. It came from LiveCaseBreak.com, who were doing a team break on BlogTV. LCB co-owner Larry Franco was understandably shocked when he made the pull, "It took 15 seconds to register. We had set the pack aside for five or ten minutes because we noticed how thick the pack was. We generally keep those until the end of the box and do a slow reveal on camera." 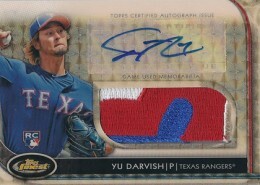 This particular card is one of two Yu Darvish Superfractors available in 2012 Topps Finest Baseball. While the other one has just an autograph, this one has an over-sized three-color patch swatch as well. This particular case break was a team-based one. Each participant got the cards from a specific team. A collector named Alex from California had the Rangers. "I am still in shock," says Alex. "When it was announced we had a super thick pack, I thought hmm, what could that be ? The suspense did kill me for a bit." Alex continued to describe what happened immediately following the pull, "When the card was pulled, it took me a couple of seconds to realize the magnitude of what had just happened. I stared blankly at the screen listening to Larry describe the card and watching the chat comments.I thought, 'Surely this must be a mistake, that can't be the actual Superfractor.' Even after seeing the 1/1 stamp, I was still in shock." Alex plans to sell the card on eBay, just not right away. Despite receiving offers on the spot during the live break, he's leaning towards waiting to see if the Rangers make a playoff run or if the pitcher finishes the season in contention for the American League Cy Young Award. "Realistically, I think the card could go for anywhere from $5,000 to $10,000," says LCB co-owner Tim Harmer. " Yu's 2012 Bowman Platinum Purely Platinum 1/1 sold for $5,000. This card is definitely a better pull than that." Did he sell the card? Lee C � I know he was going to. Don’t know if he found a buyer.